It's a new week, and I'm happy to feature two amazing girlbosses from right here in Edmonton! 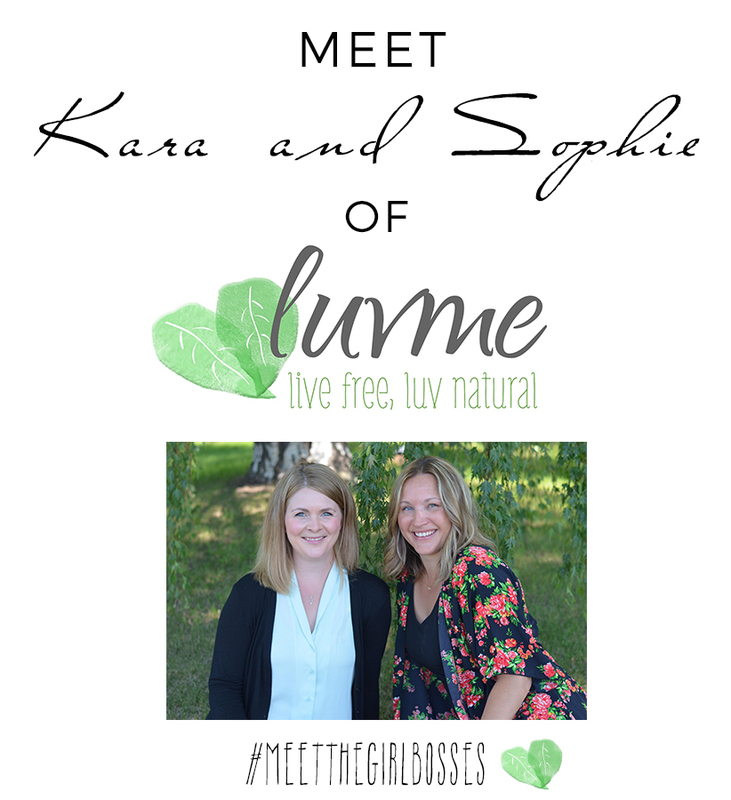 Kara and Sophie are the successful women behind Luvme, an online beauty and life store that focuses on curating healthy, great quality skincare, cosmetics and home products for the whole family. Could you describe your business for the readers who aren't familiar with Luvme? Luvme is dedicated to purveying Canada and the World for the finest natural and organic products for you and your family. We are a team of two looking to bring the best natural and organic products to you and your family. After much research, we have switched our families to natural and organic products to keep our families healthy and safe from chemicals. We continue to scour the globe for the best of the best and are proud that many of the best come from Canada. We started researching product in September 2014. We launched our website www.luvme.ca in August 2015. Sophie, my business partner came up with the idea after doing a lot of research on the benefits of going natural/organic and asked if I wanted to come on board. We met each other years back when we articled at an accounting firm. We were both starting to expand our families and we wanted to switch to natural and organic products to reduce toxins in the household. I just had my son and was trying to use more organic baby products and beauty products and thought it was a great idea. Our goal was to carry safe products for the family that actually work. Currently, we are both on maternity leave which gives us time to research and try new products to expand our website. It took us a while to build our website. We had a few ups and down in getting to our final website design. We did not want to launch it before testing it from all angles. This gave us time to try all the products we carry and ensure we only carry safe products that actually work. How did your family react? Your husbands? Our families have been very supportive from our husbands, parents, siblings, and friends. Our husbands love being our testers for the products. My husband is always asking if we have anything new coming in! Now we have little testers - Sophie has an 10 month old son and I have two boys ages 2 and 5 months old. It is was important that we only sold products that we use on our own families and that are safe. My sisters make organic baby and kids clothing for their company, Posh & Cozy, and they are very supportive by giving us social media shout outs. We have been so fortunate with social media. We have teamed up with some great companies to do giveaways and shout outs. It is great to see Canadians working together to help each business grow. It is very helpful to work with other small businesses and the support has been amazing. We would love to keep growing our business and find more natural and organic products to carry. We would love to expand our blog and continue to educate customers on the importance of reducing toxins in their lives. We would also love to spend more time with our children while operating a successful business. We are always thinking of new ideas for the website and we are excited for the future. Follow your dream! Take your time and do lots of research. There will be lots of bumps during the process but as long as you keep reaching for your goal and have a little patience, you will get there. And until November 30th, enjoy 20% on www.luvme.ca with the code GIRLBOSS20. Thank you Kara & Sophie!